It is human nature that we view our homeland in a dim light. Despite being ferociously patriotic, Brits often bemoan living in an overcrowded, over priced country where the weather is always dreary. We often dream of sunnier climbs, Australia is often quoted as a country that many people with a ‘grass is greener’ attitude wish to move to, or at least escape to for a period of time. It may surprise Brits then, to learn that our many of our antipodean cousins share the same desire to break away from their country of origin, albeit for different reasons. 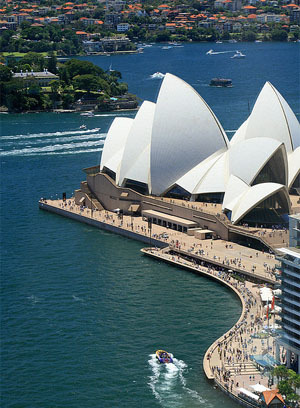 Aussies begrudge the lack of history and culture in their country, and flock in their thousands to London where they revel in the diverse populous and appreciate the intersection between the cutting edge and the traditional. Odd in that the city of Canberra is not very known by tourists, despite being the capital of Australia, those who overlook this inland settlement, Australia’s eighth largest city, are doing themselves a favour. Canberra was a planned city, built to act as the capital, a compromise between Sydney and Melbourne who were fighting for capital status in 1908. Like many planned cities and towns in England, it is clinical and lacks charm. In fact the anonymous urban sprawl reminds me of Milton Keynes, minus the rain of course. Sounds Idyllic, right? The Northern tip of Australia is quite unique in that it is dominated by rainforest and a beautiful sight it may be. The problem is, this area is home to some of the most dangerous living creatures in the world. I’m not talking lions and tigers, but the eight-legged variety of beast. The Black Widow is indigenous to this region and a bite from a female can prove fatal, the tropical rainforests here are also home to scorpions, snakes and some unsavoury plant life. The Great Barrier Reef is another spectacular site, this time located of the Queensland coast in the North East of the country. Since it is a World Heritage site it is heavily protected and there are many restrictions about where you can actually go. We found the guided tours to be quite limiting in terms of freedom. This is by no means a bad thing however, get up close and personal with the Coral and you could end up with a nasty gash. The barrier is also located in a treacherous area of the Pacific Ocean, infested with predatory sharks. What is schoolies week? Thinking Spring Break, all concentrated in one area in Queensland. Beginning in November, the seven day celebration takes place at the beginning of the school holidays and sees flocks of youngsters invade the beaches and shopping malls of the Gold Coast. Unless you’re also a a pre-pubescent youngster, avoid like the plague.